Should be ready to go home on or about June 18th. As always, pups will be wormed and have their first round of shots. I’m likely holding onto one male, but might be willing to let it go to someone who will be trialing the dog. One female is spoken for, one other pup is spoken for but not sure if they’re taking a male or female just yet. These pups are expected to be mostly Liver & White, bidable and solid field dogs. We have been looking forward to this breeding in the hopes of recapturing some of the magic of the Tridon’s Miss American Pie (Pie), and Orion’s Arch Rival (Archie) line. Dudley has made a name for himself as a very solid, honest, Champion dog. He’s a very dependable performer in the field, and has an excellent disposition in general. 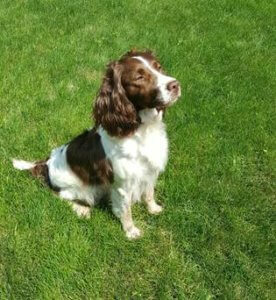 Tilly is a 37# L/W female – very biddable, eager to please, works with her handler very well. Excellent in the field. 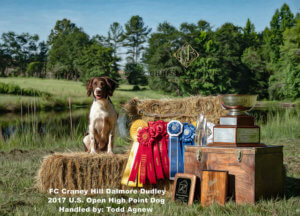 Tilly has her Master Hunter title and needs a win and 2 points for her AFC. Tilly is housed indoors and makes an excellent companion in the house.